Each year, manufactures come out with new and improved camping gear. Thanks to new technology, there is constantly lighter, more-durable gear available for all types of camping. Here are a few of the newest gadgets on the market to make camping a little more comfortable. This multi-tool is perfect for a variety of camping needs. Whether you need a fine edge blade, a serrated blade, a screwdriver, bottle opener, pliers, wire cutter, or a tripod. Yes, you read that correctly, the latest Gerber multi-tool also functions as a tripod. It is built for compact digital cameras, as well as smart phones. The Gerber Steady comes with an adjustable cell phone mount, and a screw-in camera mount. Small arms fold out from the handle to offer the tripod’s three legs of support. This year, Sea to Summit came out with a couple of new tents that are weighed in grams, not pounds—so you know they are light. 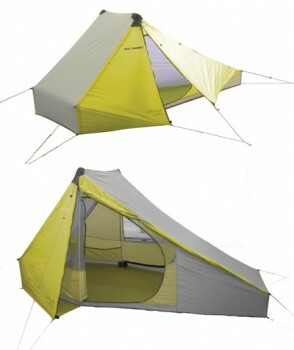 The one-person tent is made from thin waterproof/breathable Pertex fabric. With its poles, it weighs less than 1 pound. In fact, it’s only 846 grams. Need a little extra space? The two person Duo is a little wider to have room for two campers. But, it does not weigh much more than the one-person tent, at just 846 grams. Both can be set up with trekking poles, rather than the alloy poles that come with the tent. This can save a little space and weight in the already ultra light tent bag. If you’ve ever been thirsty in an area where you have to pump your water, you know how valuable this next nifty gadget can be. The Sawyer Squeeze Water Filter system is a squeeze-to-purify product. You just fill the pouch up with lake water, and then screw the filter onto the pouch. Then, just squeeze the water into your mouth for instantly filtered water. If you have been camping and have wondered what to do with your dirty clothes and gear after spending time outdoors, Stuffits now has a solution. They developed the “moisture and odor containment system” and built it into their dry bag lines. It draws in the moisture and odor, and then keeps it in the bag. If you have a camping trip planned an area where temperatures can change drastically, it’s hard to know which sleeping bag to bring. These days, you can just bring the Sierra Designs Pyro Maniac 15/30 Sleeping bag. It can provide warmth in weather up to -15 degrees. But, you can remove the extra down baffles when the temperatures rise. The tent is great for weather up to 50 degrees. You may know Wegner as the maker of the Genuine Swiss Army Knife. But, that’s not all they do these days. They are also the makers of solar chargers. Their new line for 2012 has three different models, a standard Solar Charger, Top Solar Charger and Solar Charger Pro. These can be packed on camping trips, but are powerful enough to charge phones, tablets, and GPS navigation systems. They are waterproof and portable. 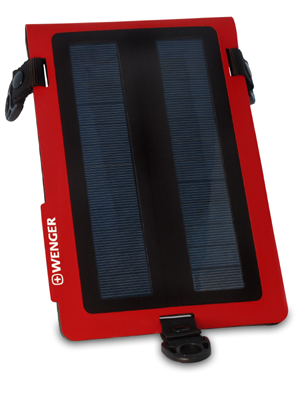 The Solar Chargers have a USB input, making it easy to charge your electronic devises.